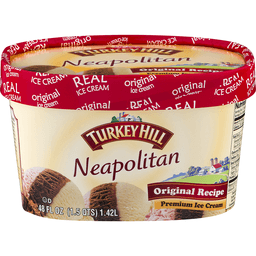 Turkey Hill Neapolitan Premium Ice Cream. Naturally & Artificially Flavored. Original Recipe Premium Ice Cream. 48 FL OZ (1.5 QTS) 1.42L. 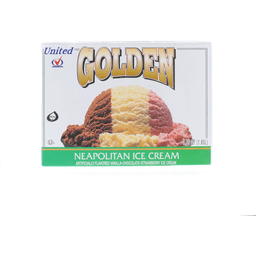 A trio of vanilla bean, chocolate, and strawberry ice creams. Where we make it is why it's good. It all started in 1931 with just a few neighbors in Lancaster County, a place with rolling hills, friendly smiles and plenty of family heritage. Armor Frey founded turkey hill dairy on traditional values like faith, hard work and an unwavering commitment to quality. Today, our neighborhood has grown, and millions have come to trust Turkey Hill to mean the finest in frozen desserts and beverages. Quality pledge: All our products are made with the finest ingredients you would expect from Turkey Hill. Please provide code date from bottom of cup. We welcome comments at 800-MY DAIRY. turkeyhill.com. Breyers® No Sugar Added Frozen Dairy Dessert Vanilla Chocolate Strawberry. 80 Calories per serving. Sweetened with Splenda® brand. Vanilla chocolate strawberry flavored with other natural flavors. See nutrition information for calorie & sugar content. Not a low calorie food. Per 1/2 cup serving: 80 calories. 2g sat fat 10% DV. 45mg sodium 2% DV. 3g sugars. Breyers® pledge: At Breyers® we put a lot of love into our products, and that is why we pledge to use only high quality ingredients. Breyers®. Founded 1866. 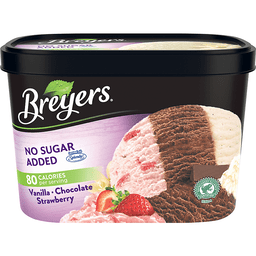 Breyers® no sugar added flavors give you all the indulgently rich and creamy taste you love without the added sugar. Go ahead and enjoy! Guarantee: If you are not satisfied with this product or have any questions or comments. Please send the UPC code and stamped information from the bottom of this container to: consumer relations, address listed above. Gluten free. Find our recipes on yummly.com/breyers. Questions or comments: 800-931-2826. breyers.com. See bottom of container for "tastes better before" date. ©Unilever.